Special offer for new boarding clients: Get your FIRST NIGHT FREE! Victoria's only true veterinarian owned and supervised Pet Boarding facility providing pampered services a family pet deserves. Our Dog boarding and Cat Boarding guests enjoy the resort experience including luxury suites or condos, indoor & outdoor playtime and supervision by our experienced and caring staff. A happy dog is a healthy dog. Our unique Veterinarian Designed Dog Daycare program here in Victoria provides your dog with the right amount of stimulating activity, socialization and rest to ensure that your dog will thrive. We conduct an initial dog daycare evaluation to determine the right playgroup for your dog. Whether it's a deluxe bath or breed specific dog grooming, our professional pet groomers will make sure that your dog or cat is the envy of the neighborhood. Our pet grooming service is available seven days a week. Give us a call to schedule a grooming or bathing appointment for your dog or cat. Whether you're looking for your pet to master obedience, gain impulse control, or teach your puppy good house manners, our personalized training program is for you. We’re here to help you & your dog build the best relationship possible. Our positive methods establish communication between pet & pet parent in a way that’s rewarding for everyone involved! The Pet Resort on Main provides the highest quality dog boarding, cat boarding, dog daycare and pet grooming. 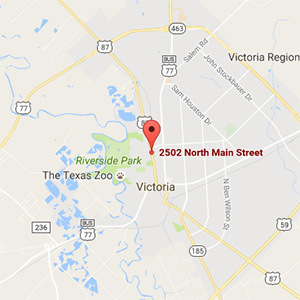 We're located in Victoria on Main St. just 1/2 mile north of Business 59 and 2 miles south of Loop 463. We're just a few blocks north of Main Street Animal Hospital.